Topics: Free - Blessings Of Grace, Seminars, Divine Mysteries, Sacred Energy Healing, and Soul Illumination. Age: It went live on June 15th 2005, making it over 12 years, 10 months old. 19 users visit the site each day, each viewing 1.30 pages. Theplanet.com Internet Services Inc (Texas, Houston) is the location of the Apache server. 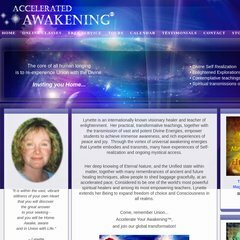 Accelerateawakening.com's IP address is 174.132.189.98. ns1458.hostgator.com, and ns1457.hostgator.com are its DNS Nameservers. PING (174.132.189.98) 56(84) bytes of data. A ping speed test response, is timed at 40.2 ms.